The amniotic fluid is the "water" people refer to when they say their "water broke." 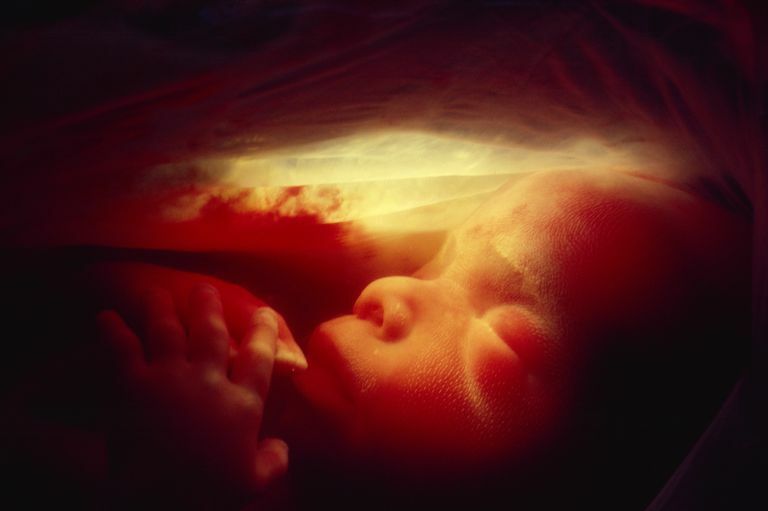 During pregnancy, the fetus is contained within a membrane filled with this fluid, which is essential for proper fetal development and a healthy pregnancy. The membrane is also commonly referred to as the "bag of waters." Amniotic fluid is usually clear to pale yellow in color. It should be odorless, or slightly sweet in odor — although some say it has a bleach-like smell. The amount of fluid increases throughout pregnancy until about 34 weeks, when it begins to decrease slightly. The fluid is made up of water, electrolytes, proteins, carbohydrates, lipids, phospholipids, and urea, as well as fetal cells. Cushions and protects the baby. Allows room for the baby to move and develop. Fills the lungs during fetal "breathing," which aids proper lung development before birth. Provides a relatively consistent temperature for the baby. Makes up the fetus’ urine. Abnormal color: The fluid may be green, brown, or blood-tinged in color. In full-term or near-term pregnancies, green or brown fluid may indicate the baby has had a bowel movement (meconium), which contributes to the color change. This can be an indication of a baby in distress or simply that the pregnancy has extended enough for the baby to pass that first stool in utero. The amniotic fluid may be blood-tinged, especially during labor, if the cervix has started dilating, or if there are placental problems. Dark fluid can also be seen with an intrauterine fetal demise (IUFD) when the fetus has died during pregnancy. Oligohydramnios: (Often simply called Oligo.) This means that there is a decreased amount of amniotic fluid in the uterus as a result of leaking fluid or a congenital problem with the fetus or placenta. This abnormality may also happen if the fetus has kidney problems — the fetus has a decreased output of urine and therefore not as much amniotic fluid. The volume of fluid can be measured via an ultrasound. Polyhydramnios: In this case, there is more fluid than normal, usually caused by congenital anomalies in the fetus, multiple pregnancies (such as twins or triplets), or gestational diabetes. In some cases, the cause is simply unknown. This abnormality can also be measured by an ultrasound. Preterm Premature Rupture of Membranes (PPROM): Complications can arise for both the mother and the fetus if the amniotic sac “breaks” too early in pregnancy. Complications include infection, impaired fetal development, or early labor and delivery. Typically the goal is to delay the labor as long as safely possible for the mother and fetus. This may call for hospitalization, bed rest, IV antibiotics, and corticosteroids to speed fetal lung maturity, which may delay the labor and increase the fetus' chances of survival if born early. Note that there is a wide range of what is "normal" in terms of the color of the amniotic fluid, the amount, and the smell. Be sure to check in with your provider and ask questions that are specific to your situation. Thomas, C., ed. Taber’s Cyclopedic Medical Dictionary, 18th Edition. 1997.